Fairly busy weekend, but I did get some build time in where I took a crack at the new Magos Dominus model. Two of them, to be accurate! I figured I'd do a Magos and an Archmagos, utilizing the various options in the kit - one built bog standard, and the other with the alternate head and weapon options. 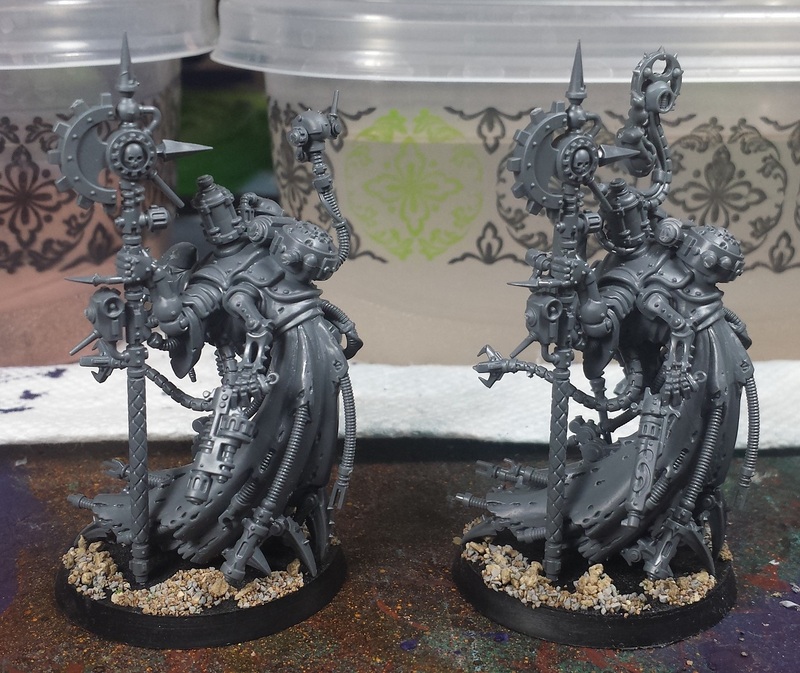 I also swapped out the servo-skull with the slightly more ornate one from the Scions kit. I experimented with the arms a bit, but the design is such that it would require some serious cutting and greenstuff to change the posing. 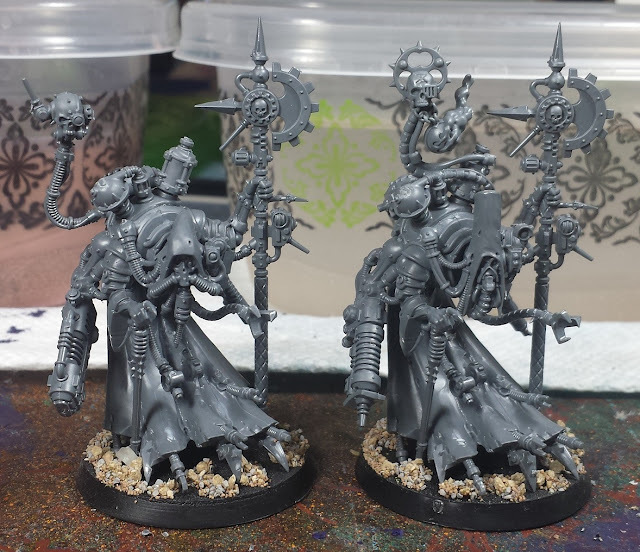 I'm thinking I'll do the basic Magos with red robes and white detailing, and the Archmagos with the reversed color scheme to help differentiate them a bit further. Quite looking forward to getting stuck in, this sculpt is absolutely fantastic! That's the first mech mini I like... Creepy as all get out! He is a lovely model. Any chance of a scale shot compared to a Skitarii? Looking at the first photo all I could think of was "Wow...thats what $124 AUS looks like in miniature form". Lovely models they be, but horribly pricey in Australian terms. I do look forward to your flipped colour schemes. Crack on good sir. Great looking model but yeah they really don't give you much room to play with them do they. I think the paintjob will really have to help make them stand out there. Looking forward to seeing that come together. Hrmm...I may have to scrounge the funds up to but that model 'just because...'. This...this has to be one of the best models GW has ever made in plastic. I am just in jaw dropping awe right now. I really like the model, but am sad that the two variants aren't made all that different from each other in this kit. @Nafnaf: Indeed, the magos kit is definitely the standout of the new plastics! @Zab: Aye, they knocked it out of the park on this model. Looking forward to giving 'em a lick of paint! @Rory Priest: Aye, they definitely suffer a bit from the CAD drawing process. They fit together really well and the 3D effects achieved that way are great, but it pretty much ONLY goes together that way. @Da Masta Cheef: Aye, this is definitely a "gonna be just fun to paint" sort of model! @Greg Hess: Totally agree - by far the coolest model I think GW has done in a long, long time. @Dai: Aye, I can see some opportunity for conversion, but it'd be more of a "replace the equipment/arms with other bits entirely" sort of proposition. I'm sure we'll see some wild conversions coming out of the kit in upcoming months! 40k Adeptus Mechanicus - Army underway!